Bicycle motion is more complex than you think, perhaps more than that of an automobile. When someone, such as a frame builder Mr. X, Y or Z, tells you that one or two design parameters alone influence the ride of your bike, all they're providing you with is a half baked cookie, if not inexperienced advice. There is more to bike design than drawing a colorful sketch of it on CAD. Wouldn't you want to know the big picture? How do different bicycle designs affect bicycle stability? How does changing this parameter or that parameter affect bicycle stability? By the way, what is stability? Take a bicycle. Will it stand by itself? No. It is statically unstable. We can also be cool and call it neutral static instability. Now ride the bike, slowly increasing speed. At low speeds, you find yourself oscillating, trying to control the bike. When the bicycle attains a certain speed, it takes lesser effort and skill to keep it moving in a straight line. Now what if one of two things happen? 1) The bicycle encounters a external disturbance to straight line motion while moving, resulting in an oscillation. 2) The rider gives an unnecessary input to the bicycle while in motion, resulting in oscillation. Now will the bicycle design be such that it dampens (kills) the oscillation as a transient response or will the design be such that the disturbance gives rise to an unbounded, dangerous motion? If the disturbance will be dampened, how soon will it be dampened and how soon will it return the bicycle-rider system to steady state equilibrium? If the oscillation does not die out quickly enough, someone could potentially get hurt and expensive property could be damaged (think a crash in a fast moving group of riders). So how quick is quick enough? Is it 2 ms, 2 hours, 2 weeks? The above are important questions in dynamic stability analysis. Stability is the most important concept in the world. I will take the liberty to say that. If a phenomenon were not stable, we could hardly observe it, understand it or study it. If sunlight wasn't stable, forget life. If there's an earthquake every minute on our planet, forget trying to do any useful work. Insanity in a human being is instability. So thank the heavens for our stable world where it matters most. Likewise, all engineered systems have to be stable. If that wasn't the case, we would hardly fly from one continent to another and see new countries, meet new people. We would hardly stay on the right orbit and reach the moon, landing a few proud men on it. If designers couldn't build a stable Ferrari F1 car for Schumacher, he wouldn't have won any fancy accolades and may have remained poor like the most of us. A bicycle is statically unstable by nature but it takes something to change its behavior such that it becomes stable and does useful work for us. For transport oriented designs, especially in busy urban areas, it is favorable that the bicycle doesn't take too much skill to become stable. If it does take high speeds and skills to ride such bicycles in such busy areas, no one is going to bother bicycling. Someone could get hurt, leave alone the attainment of a deep dissatisfaction with the whole experience. Designing and engineering a good bicycle for specific applications is paramount in asking people to get on bikes and use them to save our environment. 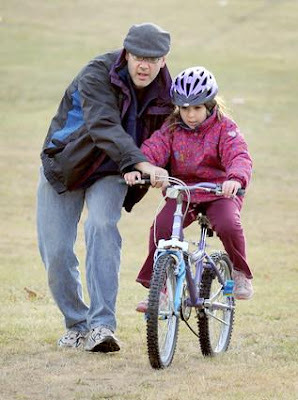 Especially if these people have never had or lost touch with the skill needed to ride a bicycle. We'll look at bicycle stability in depth in Part 2 of this series, which you can read here. Before you leave, watch the following video from UND Aerospace. The subject of the video is an airplane, but it still does not diminish the importance of stability in all engineered systems. Let's learn! Learn How to use the principles of stability. For more Aviation How-To Videos & Articles, visit WonderHowTo. Fascinating topic Ron, I've spent many hours on this, testing and trying to match theory with test results. The 'rules' do not necessarily scale for different wheelbases, small wheels and especially sub 12" wheels (but that's a topic in its self).